Search results for Technics | Search | What Hi-Fi? Feature Just 11 highly-skilled staff are responsible for the up to 150 parts that go into the high-end Technics SL-1200, SL-1000 and SP-10R turntables. ces 2019 The company's first wireless headphones feature aptX HD Bluetooth, while the premium F70 also offer noise-cancelling. 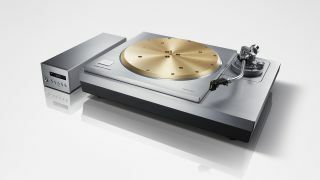 ces 2019 The new SL-1200/1210 features an updated design, new features and the promise of better all-round performance. ces 2019 Technics has updated another classic deck for 2019, with a new version of the SL-1500, originally an upgraded SL-1200. Interview On a recent trip to Japan, What Hi-Fi? met Tetsuya Itani, Technics’ CTO and chief engineer, to talk all things hi-fi. IFA 2018 The player will complement the SU-G700 stereo integrated amplifier and features Google Chromecast, AirPlay and Bluetooth. Have a voucher for the store? You’ll want to spend it before 31st May. Described by the company as its "most premium turntable ever", the SP-10R goes on sale next summer. Panasonic's 2017 press conference at CES was a low-key affair, with more emphasis on its business-to-business strategy rather than consumer products. But we did see a couple of new pieces of home entertainment kit, so here's five things we discovered. Technics has briefly turned its attention from lavish new turntables to stereo systems, with the launch of a brand new all-in-one.